Update for 2017 - Since first writing about how to grill lobster tails, my kids have gotten older and now into travel basketball and soccer. Needless to say, we spend a lot more time in restaurants with claw machines and very little time eating lobster tails. However, updating this recipe because I no longer oil the grill prior to grilling anything. Add the oil or butter to the meat, not the grates and ensure that you are preheating the grill properly to minimize sticking. Definitely start with a clean grate, but oiling that grate is not necessary. 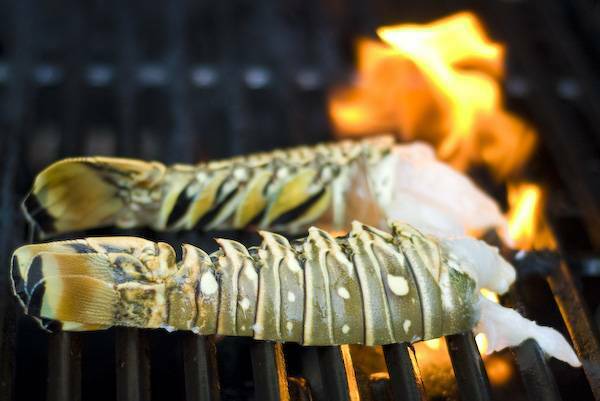 What better way to impress your grilling friends than to serve up grilled lobster tails. When thinking about how to grill lobster tails, don't overthink things, this is a delicate piece of meat that doesn't need a lot of help. Don't tell the friends you are about to serve, but grilling lobster tails is pretty easy to do! And delicious. The hardest part of this recipe is deciding which guests are worthy of this awesome treat. Add a nice steak to the menu and you will have friends for life! Follow these easy steps for grilling lobster tails. 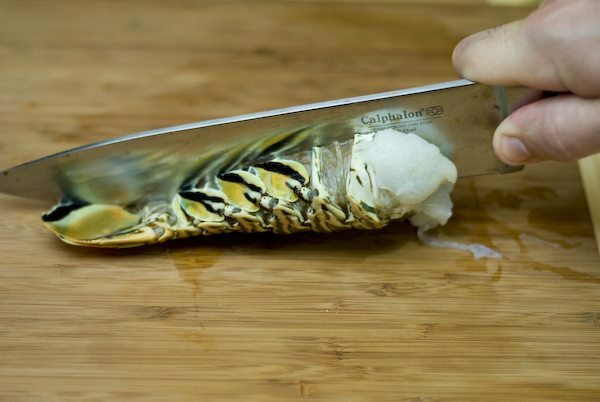 1If the lobster tails are frozen, start by thawing them to room temperature by placing them in a plastic bag and then submerge them in a warm bowl of water. 1Next create a basting sauce. Melt the butter in a small dish in the microwave, or warm in a small pan and remove from heat. Mince the garlic or use a garlic press to mince the garlic and add to warm butter. Add one tablespoon of fresh squeezed lemon juice and stir. 1Lay the tails bottom side up on a cutting board. Using a large knife, cut the tails in half length-wise. Use kitchen scissors to get all the way through the shell if you need to. Using a brush, thoroughly baste the flesh side of the tails with the butter mixture. 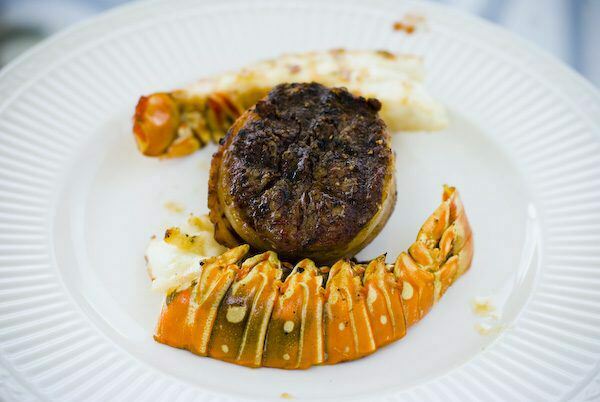 1Make sure you are starting with a clean and well pre-heated grill before grilling your lobster tails to minimize sticking. 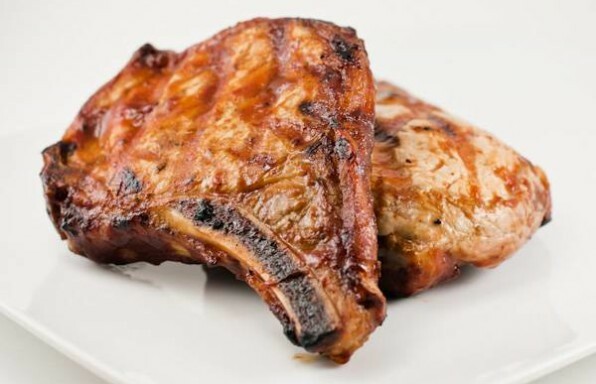 Using a gas grill, turn the grill to medium-high heat. For charcoal, distribute the coals so there is an even heat. 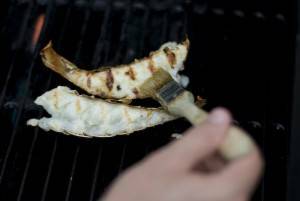 1Once the grill is hot, at least 15 minutes, give the lobster tails one last baste, add a bit of salt and pepper and place them flesh side down on the hot grill. Be careful of flare-ups from the dripping butter. Cook flesh side down for 4 to 5 minutes until light grill marks show. Flip the lobster tails to shell side down. Baste with the butter mixture several times during the next 3 to 6 minutes until the lobster meat is firm and opaque. 1Tie on your lobster bibs, heat some butter, and dig in. 2Or, better yet, add a few filets to the grill, and you have a beautiful Surf and Turf. Follow us on Twitter to get updates on our latest recipes, tips and grilling articles we find around the Internet. Just did this tonight. OMG. We had smaller lobster tails (on sale for $5.00 each) so we cut cooking time. But holey moley, BEST lobster tails we’ve ever cooked. Perfect recipe. Thanks. Very nice recommendation! The tails turned out great! The “don’t over cook” comments were spot on! 4 minutes a side on my charcoal Weber. The most important thing with lobster, and any seafood is not overcooding it. One once is it opaque it is done. The longer you cook it after that the tougher and dryer it will get. I cut each tail half in three pieces and put them on a skewer, alternating chunks of fresh pineapple with the pieces of lobster and whole jumbo shrimp. The garlic butter in this recipe was excellent. I cooked them 5 minutes on each side. Thanks for your advice on prep and cook time. Thank you for this! I have never grilled lobster. I followed this recipe and it was delicious! The part I wasn’t sure about… how long to grill it. Like grilling shrimp. Very quick and easy. It was perfect! I HAVE GRILLED LOBSTER TAILS MANY TIMES AND HAVE YET TO SCREW IT UP. THANKS FOR THE HELP. I HAVE GRILLED LOBSTER MANY TIMES AND HAVE YET TO SCREW THEM UP. THANKS FOR THE HELP. Make sure the coals are white and this will make a huge difference. Med heat reduces flair ups. Have a salmon filet with melted butter with basil and your own fish seasons. Always add a squeeze of fresh lemon. Nice with a glass of Chardonnay. I have grilled TONS of food over many decades, but never grilled lobster. This recipe was quite simple and delicious! Highly recommended.